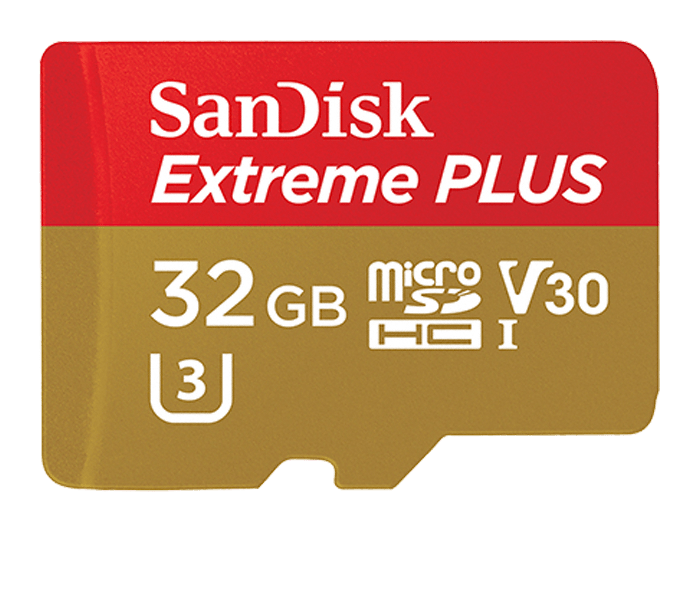 SanDisk Extreme Plus Micro SD Card in 32GB capacity. SanDisk and SanDisk Extreme are trademarks of Western Digital Corporation or its affiliates, registered in the U.S. and other countries. The SDHC/SDXC mark and logo are trademarks of SD-3C, LLC. © 2016 Western Digital Corporation or its affiliates. All rights reserved. Up to 95MB/s (633X) read speed; write speed up to 90MB/s (600X). Based on internal testing; performance may be lower depending on host device.